The affordability and (supposed) easy application of box hair color can be tempting, but is it really worth the risk? Despite the promises made by actresses and celebrities with beautiful hair in box color commercials, you don’t often get the results you’re looking for and end up with a big hair color “oops.” We’ve found a few common box hair color mishaps and how they could have been avoided with a professional hair color application at your favorite salon. This seems to be one of the most common issues with box color. You pick up a chestnut brown shade for a warm fall look, but the color comes out looking either far too red or much darker than planned. So what happened? Because it’s bought right off the shelf, box color has to be formulated as a “one size fits all” color, not a formula that is unique to your needs. Your box color can’t take into account your natural hair color, previous color applications, your hair’s porosity, and more, resulting in a final color that was not what you had intended. A trained, professional colorist can evaluate your hair and create a customized color application just for you. And if the finished shade isn’t exactly what you hoped for, your stylist can adjust it with a toner before you leave the salon. While a professional color service is more expensive than picking up that box color from a drugstore, it may cost you less in the long run. After a botched box color job, several people find themselves heading to a salon to get a color correction treatment by a professional. 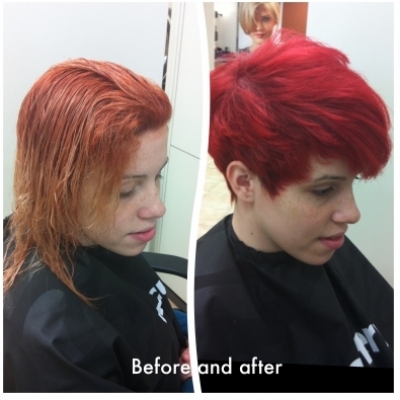 After a color treatment, your hair should feel healthy, not dry and damaged! However, the result is often the latter with box color. In order to work on a majority of hair types, box color is formulated with higher concentrations of dye and developer than are used in professional salon applications. This results in very porous hair, and increased porosity is what causes our hair to feel frizzy, dry, and like it has turned to straw. As with achieving your desired hair color, a stylist can evaluate your locks and create a color formula and application process that will work best for you. The result of a professional color application is hair that feels healthy, looks great, and is full of body. This is a classic box color mishap. You’ve dyed your hair before and have let it grow out a few inches (or more), but now you’re ready to dye the regrowth. The box color you purchased advises you to apply the color to your entire length of hair. As a result, you have roots that don’t match your ends, and bands of mismatched color in between. What went wrong? The un-dyed hair at your roots has a different porosity (and less damage) than the hair that has previously been subjected to dyes. Hair with a higher porosity takes color more quickly, resulting in darker ends. You may also see bands of color throughout your hair where the un-dyed and previously-dyed portions of your hair meet. A professional colorist will be able to adjust your color application to avoid banding and splotchy color. By applying the new color just to the regrowth and avoid any overlap with the existing color, the result will be beautiful, flawless color, not a head full of different shades. The next time you’re thinking about refreshing your look with a new color, plan a salon visit with a professional! At Hair Cuttery, our color experts are both trained and licensed so they can give you the look that you’ve been dreaming of, whether it’s a single-process color, highlights, or the currently popular ombre look. And we all know that the best accessory to a new hair color is a fabulous new haircut that will really show off your new ‘do.